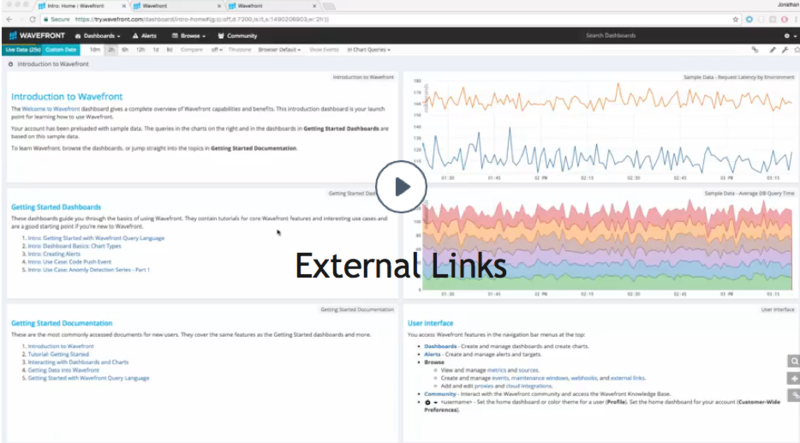 Learn how to manage external links. External links provide integration between Wavefront and external systems. If you use logging systems such as ELK and Splunk, you can easily construct a meaningful URL to navigate from Wavefront to a log entry. Suppose while analyzing metrics data you find an anomaly such as an unexpected drop in transaction rate and you want to navigate to logs to look for entries that could shed light on why the transaction rate drop occurred. External links allow you to click through from a Wavefront series directly to a related entry in your logging system. External links are general purpose: you can link through to any type of system, not just logs. To view and manage external links, select Browse > External Links. While every Wavefront user can view external links, you must have External Links Management permission to manage external links. If you do not have permission, the UI menu selections, buttons, and links you use to perform management tasks are not visible. Right-click a series. The series context menu displays. Select Browse > External Links. Specify a link name and description. source The source of the series. startEpochMillis Starting time of the chart window, in milliseconds from the UNIX epoch. endEpochMillis Ending time of the chart window, in milliseconds from the UNIX epoch. <pointTagName1>, <pointTagName2>,... One or more point tag names associated with the series. You can apply functions to transform their enclosed sections. All functions begin with the namespace functions. epochMillisToEpochSeconds Converts epoch milliseconds to epoch seconds. epochMillisToISO Converts epoch milliseconds to an ISO8601 representation. epochMillisEra,epochMilliscenturyOfEra, epochMillisyearOfEra,epochMillisYearOfCentury, epochMillisYear,epochMillisMonthOfYear, epochMillisDayOfYear,epochMillisDayOfMonth, epochMillisWeekyear,epochMillisWeekOfWeekyear, epochMillisDayOfWeek,epochMillisHalfDayOfDay, epochMillisClockHourOfHalfday,epochMillisClockHourOfDay, epochMillisHourOfHalfday,epochMillisHourOfDay, epochMillisMinuteOfDay,epochMillisMinuteOfHour, epochMillisSecondOfDay,epochMillisSecondOfMinute, epochMillisMillisOfDay,epochMillisMillisOfSecond 0 for BC, 1 for AD. See Joda-Time - Java date and time API.